In general, DSLR cameras should be considered in the same category as HDMI cameras with regards to using them for streaming with IBM Cloud Video. They will require an HDMI output from the camera, with a capture device or capture card between the camera and the encoding (streaming) computer. There are limitations to using DSLR cameras that are outlined below. Many DSLR cameras are not suitable for streaming because they do not provide a clean output over their HDMI port. They only provide a mirror of what is in the viewfinder, which often has overlays showing settings like battery life, etc. Some DSLR models provide an option to turn off these character displays and provide a true "clean" output over HDMI, but not all, so you should check your specific make and model if it can do this. Another reason why some DSLRs are not ideal for streaming is because they offer less audio capabilities than a true live video camera. You will want to make sure that the camera you are using can input live audio from an external microphone or audio source (not just use the low-quality built in mic) and can also output that audio over the HDMI port. Not all DSLR cameras are designed for extended live use. Some models will overheat and automatically shut down if shooting video for extended periods of time, which will be unsuitable for applications where you plan to stream for longer than 2-3 hours a time. The Canon T2i has a mini HDMI out. This requires an HDMI cord with a mini HDMI adapter on once side and a regular HDMI adapter on the other side. Plug in the thunderbolt cord to your computer and the Blackmagic box. Plug the HDMI cord into the Canon and the HDMI In port on the Blackmagic. Turn on the camera. Select the Video option and select Menu. Under Movie rec. size, set the resolution to 1920x1080, at 30 fps. 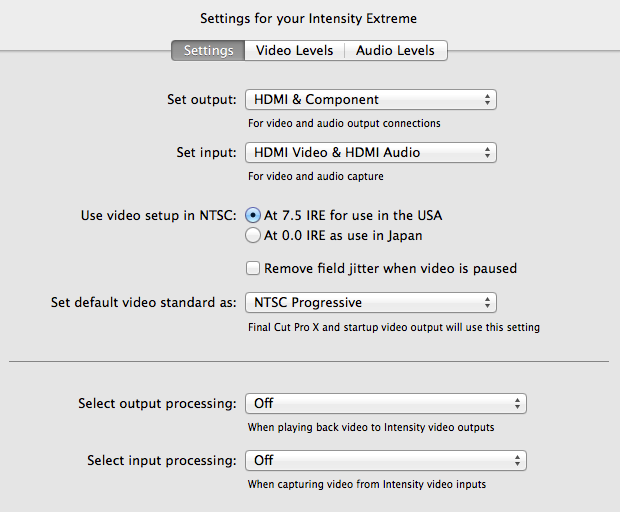 Now open your Virtual encoder and you should see "Intensity Extreme" or Blackmagic device as a source. Be sure that your capture card and output of your camera share about the same sample rate to avoid dropped frames.